Jeanno Gaussi participated at Coup de Ville 2013. This text was published in the catalogue. Jeanno Gaussi caused a furore as a video artist and filmmaker. 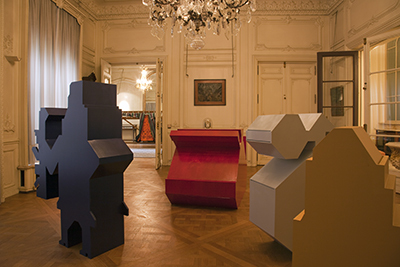 Since 2007, her conceptual starting points have also found resonance in objects, performances, publications and interventions in (public) space. Her successive and always differing stages of life in Kabul, Delhi and Berlin form the raw material that her life has handed her, and she uses this in her art to reflect on ‘a possible identity’. She recuperates the concept of identity from her personal, conflicting memories and in doing so also gathers the stories of others. She wants to get beyond the nostalgic dictate: ‘belonging somewhere’ – something that people obtain by subscribing to the desired stereotypes or ‘templates of the Other’. What is particularly alienating is the realisation that, over the course of time, the status of the so-called ‘homeland’ slowly slips away into that of ‘diaspora’. This change, and eventual fading, seems irreversible, simply because people settle down in what originally passed as a ‘foreign’ country. Despite this cultural adaptation, people in their new homes (often for life) are still categorised as ‘exotic’. 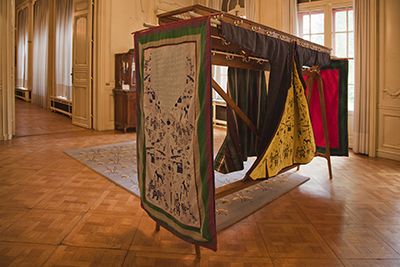 When Gaussi turns her attention to ‘warlocks’ – carpets depicting war motifs that are mainly produced by refugees in the neighbouring countries of Afghanistan – this choice is problematic in several respects. Firstly, as concerns her personal position in this context: with respect to this horrible situation, Gaussi’s place is characterised by alienation. Obviously, this does not exclude her empathy – quite the contrary! Still, a feeling of dissociation predominates, which is so poignantly expressed in French symbolism with: “Je suis un autre.” In Gaussi’s case, these words indicate a socio cultural tie much more than containing a distance. At the same time, Jeanno Gaussi is also the ‘autre’. Another issue that pertinently presents itself is the assimilation of war carpets – with their AK-47s, grenades, tanks and numerous other tools of war – into the commercial circuit, and by extension into the world of entertainment. In other words, their production has become a profitable market. Aware of this complexity, the artist makes semi-abstract drawings and geometric reliefs based on the visual vocabulary of war carpets. 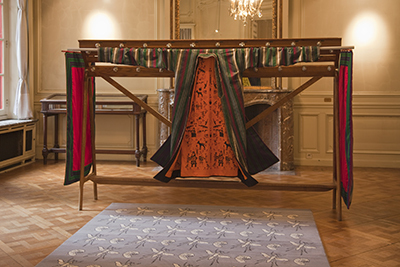 Within the same space, she displays handmade Karzai capes, finely decorated overclothes with colour variations that were worn by the educative staff during their lectures.